Haiti Is Facing A Humanitarian Crisis We Can Solve — So Why Aren’t We? Of the many humanitarian crises challenging the world today, none is as solvable as the human disaster that Hurricane Matthew has wrought in southwestern Haiti. The threats to human life in Haiti’s Sud and Grand Anse departments are entirely within our grasp to address immediately: starvation, exposure and disease—cholera, from contaminated water. And we have the solution at hand: food, shelter, clean water, medicine and sanitation supplies. The only barrier is the collective will and resolve to act. Not doing so now — as we approach the one-month mark — means certain death for thousands of people, perhaps tens of thousands. Hurricane Matthew hit the United States with wind, rain and floods that have tragically killed more than 40 people, but gave its hardest punch to southwestern Haiti. The category 4 storm made a direct hit on the remote peninsula, killing hundreds and pummeling the landscape with brutal 145 mph winds and as much as 40 inches of rain. The wind stripped trees, ripped off roofs and toppled block walls. Overflowing rivers tore out bridges and spread cholera bacteria. Crops not killed by wind were drowned by a surge of seawater; ocean water also flooded wells, contaminating precious sources of fresh water. As a result, an estimated 1.4 million people are in need of assistance, many without food, safe water, shelter or basic health services, and children are often the most vulnerable. Because the few roads that serve this region are badly damaged, towns along the southwestern coast were without help for days. In Port-à-Piment and Port Salut, some health clinics and cholera treatment centers are damaged, but functioning with limited supplies and an increasing patient load. Food is scarce and the vast majority of homes are damaged or destroyed. Cholera, a deadly diarrheal disease, is a serious concern with more than 3,400 suspected cases in the three weeks following the storm. Patients are arriving at cholera centers, but without additional, ongoing deliveries of large quantities of IV fluids, water purification supplies — tablets or even bleach — and basic sanitation items such as soap and gloves, the disease will most certainly expand its deadly reach, making the hurricane’s death toll a footnote. In some damaged health facilities cholera patients are treated alongside children and pregnant women, increasing the risk of infection. In the hardest hit communities, 100 percent of homes are destroyed, there is no food, little water and no aid deliveries. Understandably, people in the region are becoming increasingly desperate. With their livestock dead and crops stripped, survivors can’t subsist without outside help. Without shelter, they are at risk of exposure. When all water sources are most likely contaminated with cholera bacteria, they can’t safely take a drink. And with roads blocked and no aid trucks in sight, all hope is gone. 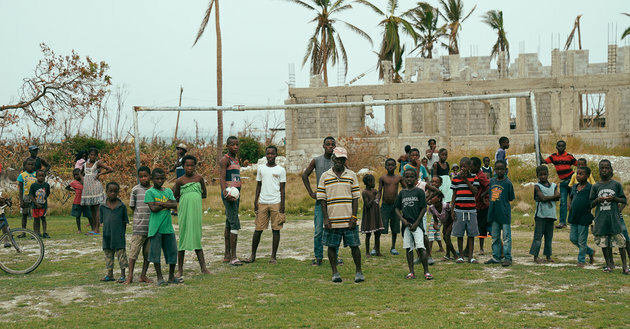 The Haitian government and local communities are doing their best under tough circumstances. Our organizations with decades of experience working in Haiti are also mounting significant relief responses. Like partners and peers, we have qualified teams on the ground with many Haitian staff members leading the charge and are rushing aid to as many communities as we can. But our experience tells us that these collective efforts are not enough. As UN Secretary General Ban Ki-moon said, “A massive response is required.” The need for food, shelter, medicine and cholera prevention and treatment supplies is too urgent. The United Nations is seeking $119 million for Haiti’s recovery but so far only 28 percent of that has been raised. Will the commitment be met by member nations? If so, when? There is no time to find out. This disaster requires mobilization at a huge scale and fast. The U.S. government has deployed resources but if it does more, it will signal the urgency to others. Individuals, corporations and foundations need to support the work of qualified relief agencies that can save lives. Amid the spin and noise of the news cycle, let’s not tune out the voices expressing human needs. There are a lot of complicated things in the world. This crisis is not one of them.